For Breakfast I toasted a couple of slices of Healthy Life Whole Grain Bread, topped with I Can’t Believe It’s Not Butter. Then I fried one Egg Sunnyside Up and fried up 2 Jennie – O Turkey Breakfast Sausage Links. Along with my morning cup of Bigelow Decaf Green Tea. It was god to have a day with no rain but that ended today with rain moving back in this afternoon. Before the rains moved in I washed down the outdoor furniture. Then it was to the shed to do some Spring Cleaning. I gave the neighbors a lot of Dad’s old tools he’ll never use again. Tossed a lot of junk out. Afterwards I made some of the Bear Creek Potato Soup. I’m going to take some to Dad for his Dinner tomorrow, hopefully he’ll get to come home soon. 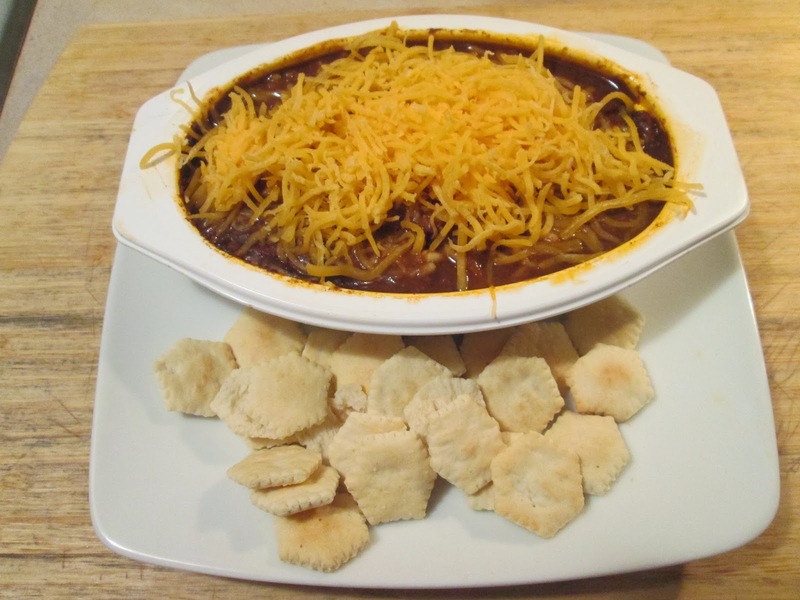 For Dinner tonight its a Skyline 3 Way – Chili, Spaghetti, Cheese w/ Side of Oyster Crackers. 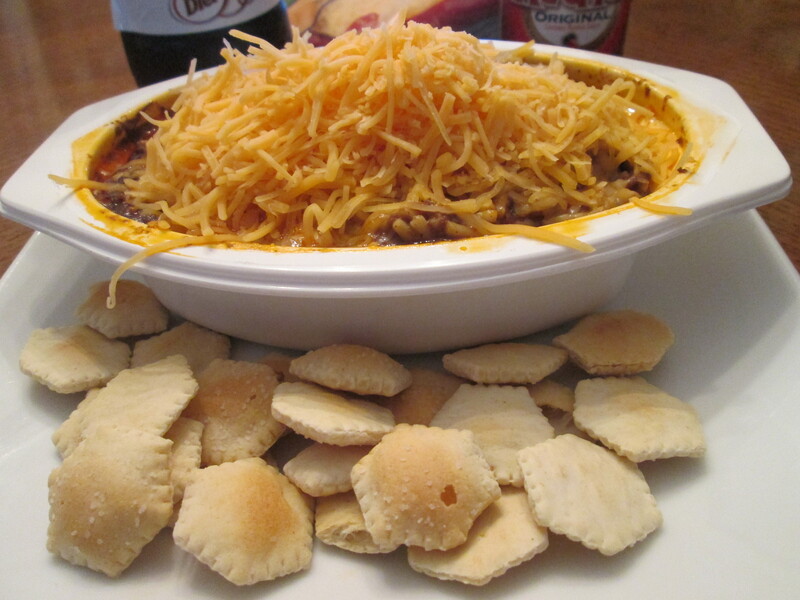 I was in the mood for some Skyline 3 Way – Chili, Spaghetti, Cheese w/ Side of Oyster Crackers. Nothing says comfort food more than a Skyline 3 Way! 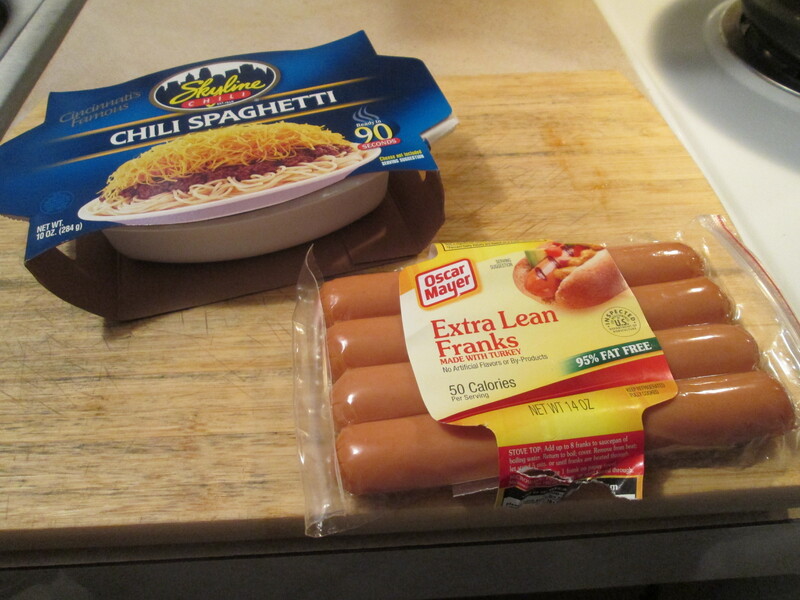 As always I used my favorite, the Skyline 3 Way – Chili, Spaghetti. It comes packaged for the microwave, a bit smaller size than what you get at a Skyline but just right for those still watching calories and carbs. It comes with Spaghetti topped with Skyline Chili. To prepare it, it couldn’t be easier! Just peel back the cover film about an 1″, to vent it. Place the tray in a dish and set the dish in the microwave.Heat on high for 1 1/2 minutes. Let stand one minute. Remove from the microwave and peel off the cover film. Stir it up and top it with the Sargento Cheese and you have the classic Three-Way! The Chili Spaghetti is 270 calories and 20 net carbs. I also had a side of Skyline Oyster Crackers. And if you’re having Oyster Crackers, then Frank’s Red Hot Sauce is a must! Just add a few drops on top of the Crackers, local way to have your Oyster Crackers. For dessert later a Weight Watcher’s Cookie and Cream Ice Cream Bar. * No refrigeration required. Store it on your shelf or in your desk! Spaghetti with meatballs (or spaghetti and meatballs) is an Italian-American dish that usually consists of spaghetti, tomato sauce and meatballs. York City; the National Pasta Association (originally named the National Macaroni Manufacturers Association) is said to be the first organization to publish a recipe for it, in the 1920s. 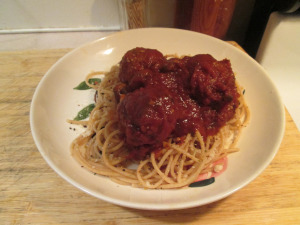 Italian writers often mock the dish as pseudo-Italian or non-Italian because, in Italy, meatballs are uncommon and smaller. However, various kinds of pasta with meat are part of the culinary tradition of the Abruzzo, Apulia, Sicily, and other parts of southern Italy. A recipe for rigatoni with meatballs is in Il cucchiaio d’argento (The Silver Spoon), a comprehensive Italian cookbook known as the “bible” of Italian Cooking. Other dishes that have similarities to spaghetti and meatballs include include pasta seduta ‘seated pasta’ and maccaroni azzese in Apulia. Totally different are the baked pasta dishes from Apulia, where meatballs, mortadella, or salami are baked with rigatoni, tomato sauce, and mozzarella, then covered with a pastry top. Other pasta recipes include slices of meat rolled up with cheese, cured meats and herbs (involtini in Italian) and braciole (bra’zhul) in Italian-American and Italian-Australian slang, that are cooked within sauce but pulled out to be served as a second course. Commercially manufactured frozen garlic bread was developed in the 1970s by Cole’s Quality Foods in Muskegon, Michigan. Another beautiful day out there again! Dad will be released from the rehab center and home Thursday! He’s getting along better, walking without the walker even. I had to go to the bank and then stopped and got the car washed, then back home. For dinner tonight a Cincinnati and a personal favorite, Skyline! I prepared a Skyline 3 Way – Chili, Spaghetti, Cheese w/ Side of Oyster Crackers. I used my favorite as I said, the Skyline 3 Way – Chili, Spaghetti. They sell it packaged for the microwave, a bit smaller size than what you get at a Skyline but just right for those still watching calories and carbs. It comes with Spaghetti topped with Skyline Chili. I added a few dashes of Frank’s Red Hot Sauce and Cheese to make it a 3 Way and used Sargento Reduced Fat Shredded Sharp Cheese. The Chili Spaghetti is 270 calories and 20 net carbs. I also had a side of Skyline Oyster Crackers. And if you’re having Oyster Crackers you must have some Frank’s Red Hot Sauce! Just add a few drops on top of the Crackers, local way to have your Oyster Crackers. For dessert later a Healthy Choice Dark Fudge Swirl Frozen Greek Yogurt. Humid and hazy out today. Went and seen Dad this morning, looks as though he may come home around September 10th. Came home and repaired Mom’s Sweeper for her. Then watched College Football for the afternoon, first weekend of Football! Love Football starting but that also means that the Summer is almost over! It went quick this year. Mom ate with Dad at the rehab center so it was solo cooking for dinner. 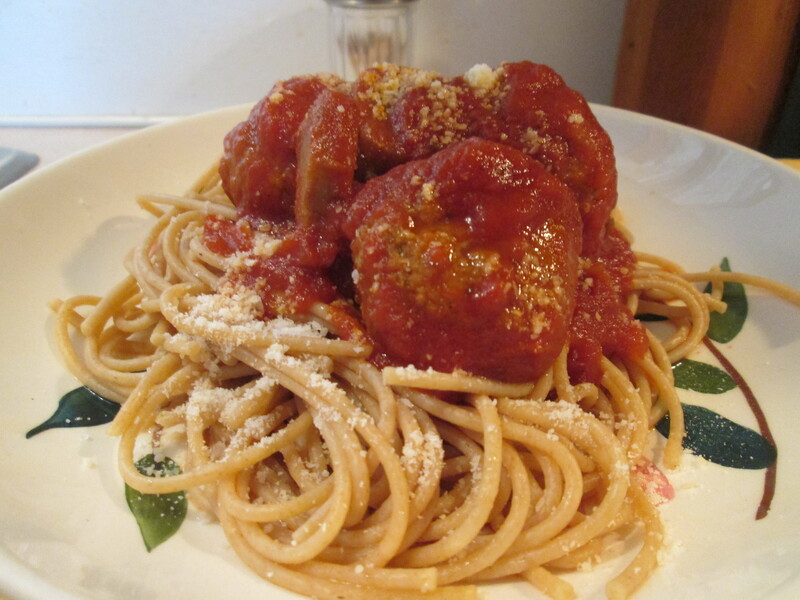 Tonight one of my favorites, Spaghetti and Meatballs. I used Ronzoni Healthy Harvest Whole Wheat Spaghetti, my favorite Pasta. Cooks up great and an excellent tasting Pasta. Then for my Meatballs I used Honeysuckle White Turkey Meatballs. 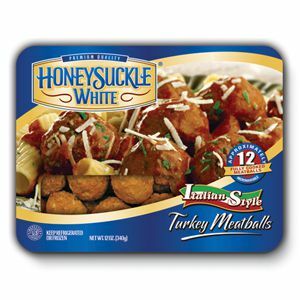 The Honeysuckle White Turkey Meatballs are good size, meaty, and have a fantastic taste and their 190 calories and 5 net carbs for 3 Meatballs. I almost always use Jennie -O when using Turkey but no store in this area sells Jennie – O Turkey Meatballs. On a Jennie – O Turkey note, Kroger has started selling Jennie – O Turkey Bacon now. For my Pasta Sauce I used LaRosa’s Original Sauce. A local favorite and still one of the best Sauces I’ve had. For dessert later a bowl of Breyer’s Carb Smart Vanilla Bean Ice Cream topped with some fresh sliced Peaches. People with diets high in fiber have a lower risk for weight gain, obesity, development of insulin resistance and diabetes. Fiber also prevents constipation, hemorrhoids and diverticulitis, but it also helps reduce the risk of certain chronic diseases like colon and breast cancer. Fiber may help lower LDL (bad) cholesterol and total cholesterol, therefore reducing the risk of heart disease. It can also help lower blood sugar to better manage diabetes. I started fasting last night at 10:00 till my doctor’s appointment at 10:00 this morning, nothing but water. Had a check-up and they took blood work to check my sugar, cholesterol, and such. I’ll get the results in 4 days or so. Another chilly day out there, sunny but breezy and only a high of 32 degrees. Warmer starting tomorrow but a lot rain coming with it. For dinner tonight another comfort food classic, 3 Bean Buffalo Chili w/ Shredded Sharp Cheddar and Oyster Crackers! I had some of the delicious 3 Bean Buffalo Chili leftover so I heated that up for my Chili topping. 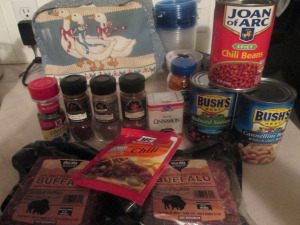 The Chili contains; Wild Idea Buffalo’s Ground Buffalo which is the best tasting Ground Buffalo that I’ve found, the 3 Beans I use are 1 Can (15 oz.) Chili Beans, 1 Can (15 oz.) Kidney Beans (rinsed), and 1 Can (15 oz.) Great Northern Beans (rinsed). Then I mix in 1 White Onion (medium Chopped or Minced), 1 Jalapeno Pepper (Unseeded and Chopped), and 3 Cloves Minced Garlic. For my spices I use 1 Packet McCormick Chili Mix, 2 Cans (6 oz.) Hunt’s Tomato Paste, 1 Tbs Ground Cocoa Chili Blend (McCormick), 1/2 Tsp Ground Chipotle Chili Pepper (McCormick), 1 Tbs. Ground Roasted Cumin (McCormick), 2 tbsp Ground Cinnamon (McCormick), 1 Tbs of Cilantro Leaves (McCormick), and 5 Dashes of Frank’s Hot Sauce or to taste (I usually add a lot more dashes!). Throw in a 1/2 cup of Water and put the lid on the Crock Pot and set on low for 5-6 hours. Then you have yourself some good, comfort food Chili! 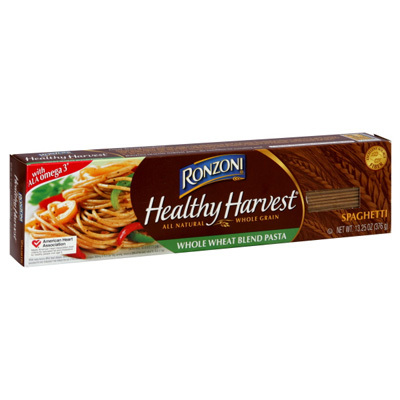 For the Pasta I used Ronzoni Healthy Harvest Whole Wheat Spaghetti, my favorite Pasta. The best tasting Whole Wheat Pasta I’ve found, and tried a few of them. It’s 180 calories and 35 net carbs per serving. After boiling I served it up and topped it with the perfect topping, 3 Bean Buffalo Chili and Sargento Reduced Fat Shredded Sharp Cheddar Cheese! This was too good! Served with a side of Skyline Chili Oyster Crackers. This is what’s called a 4 Way around this area; Spaghetti, Chili, Beans,and Cheese. You can add Chopped Onions to make it a 5 Way. Anyway you choose to make it it’s Delicious! For dessert later a Healthy Choice Dark Fudge Swirl Frozen Yogurt. 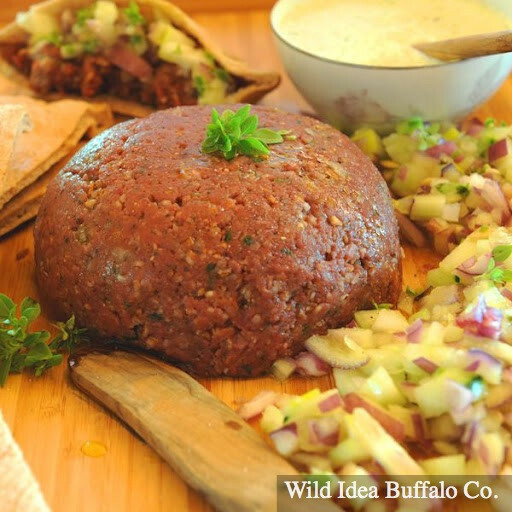 *Brown Buffalo in large saucepan on medium-high heat 10 min. or until no longer pink, stirring occasionally. Add all remaining spices and ingredients except 1 can of the tomato paste. *Serve in bowl or mug with cheese and the oyster crackers, A Tablespoon of fat-free sour cream, or serve with some home made cornbread. We use the Top Round and the Sirloin Tip cuts and remove all visible fat, for this super lean meat. It is rich and dark in taste and color. Substitute for any of your favorite ground dishes. 74 degrees and sunny yesterday and 30 degrees with blowing snow and a possible 1″-2″ of snow by later tonight! This weather is really getting old. Not feeling much better today, Sinus Infection. Keeping it short so I can lay back down and rest. 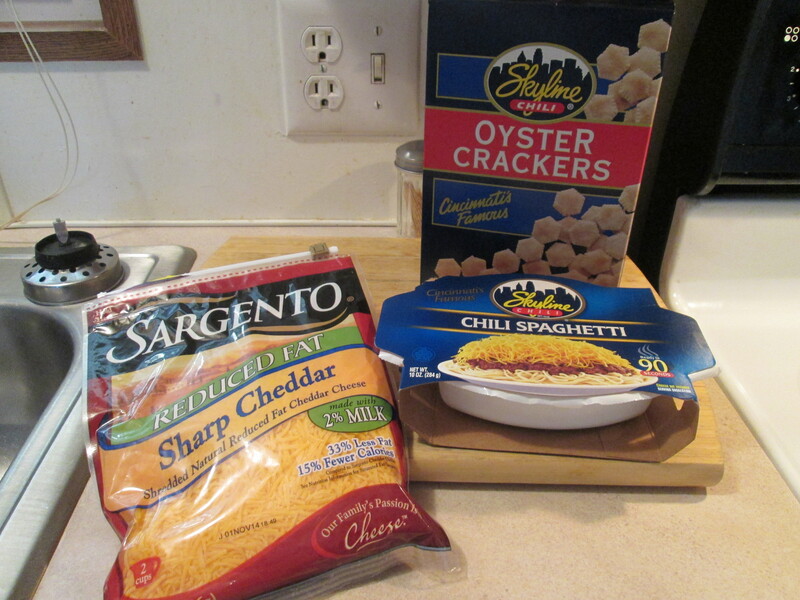 Wanted something easy to prepare so for dinner its Skyline Chili and Spaghetti – 3 Way w/ Oyster Crackers. 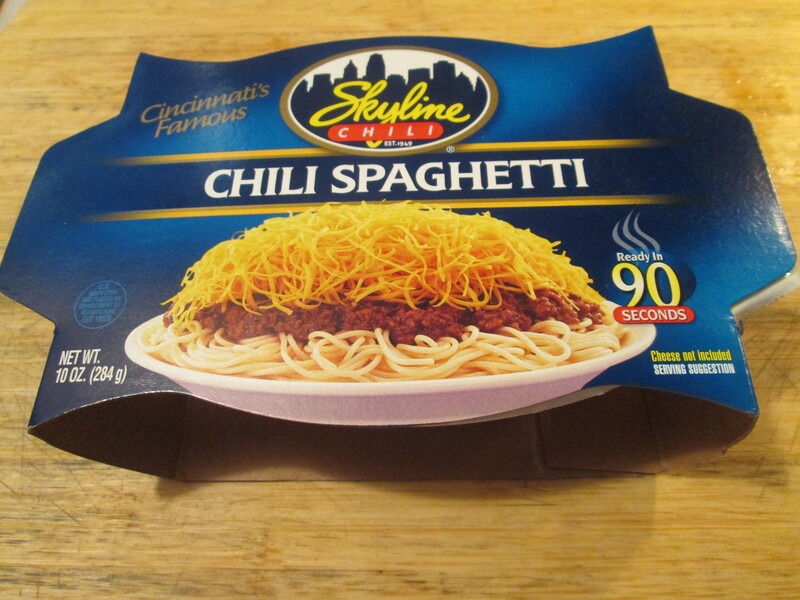 I used my favorite, the Skyline 3 Way – Chili, Spaghetti. They sell it packaged for the microwave, a bit smaller size than what you get at a Skyline but just right for those still watching calories and carbs. It comes with Spaghetti topped with Skyline Chili. I added a few dashes of Frank’s Red Hot Sauce and Cheese to make it a 3 Way and used Sargento Reduced Fat Shredded Sharp Cheese. The Chili Spaghetti is 270 calories and 20 net carbs. I also had a side of Skyline Oyster Crackers. For dessert later a Healthy Choice Dark Fudge Swirl Frozen Yogurt. Welcome back to the still frozen tundra of West Chester, Ohio! I’ll be glad when this deep freeze passes, they say one more day of below zero and by Thursday a balmy 25 degrees, you have to start somewhere! I got my Mom’s car repaired and now I think the weather has taken a toll on mine, it will be in the shop some time this week. 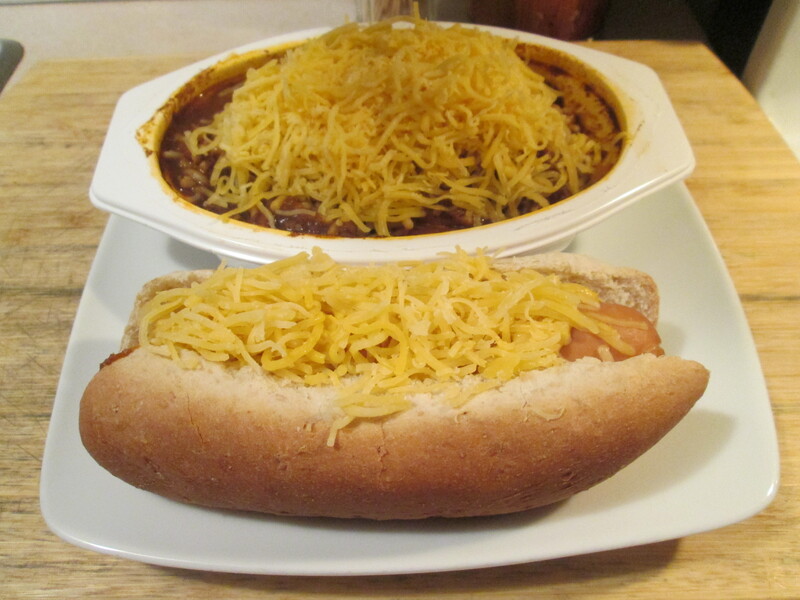 For dinner a cold winter’s day classic, Skyline Chili and Spaghetti – 3 Way w/ Chili and Cheese Coney! What better way to heat it up a bit. 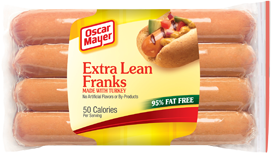 Then I also prepared an Oscar Mayer Extra Lean Turkey Franks, my new choice of Hot Dogs. Just boiled them for 5 minutes and they were ready. Opened a small can of Skyline Chili and heated it up, for topping for the Hot Dog. 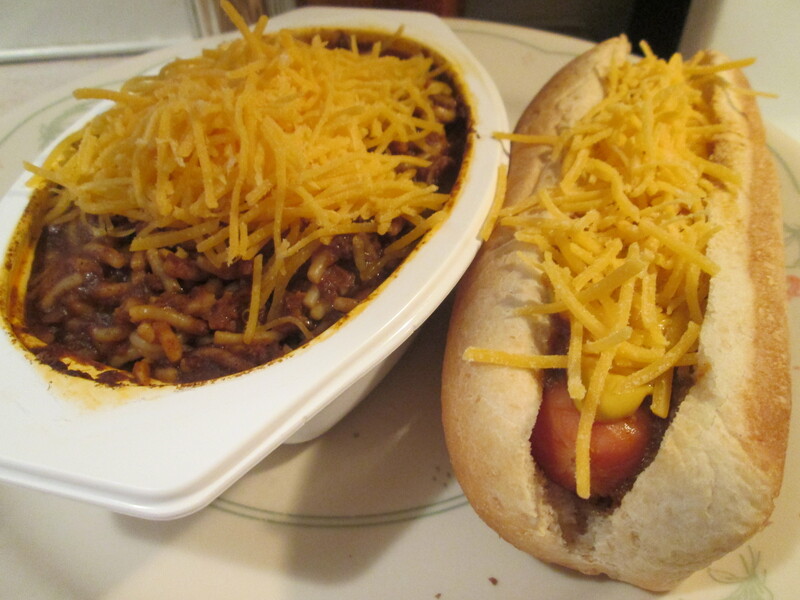 Served on a Aunt Millie’s Reduced Calorie Hot Dog Bun and topped with Skyline Chili, French’s Yellow Mustard and Sargento Reduced Fat Shredded Sharp Cheddar. For a dessert/snack later a 100 Calorie Mini Bag of Jolly Time Pop Corn.